Our Abpromise guarantee covers the use of ab15645 in the following tested applications. Publishing research using ab15645? Please let us know so that we can cite the reference in this datasheet. 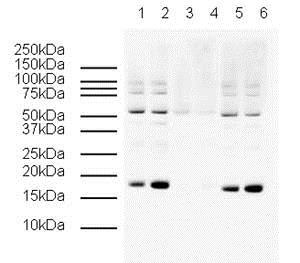 What is the buffer formulation for product Human gamma H2A.X (phospho S139) peptide (ab15645)? Product Human gamma H2A.X (phospho S139) peptide (ab15645) is provided in the following buffer solution: 150mM NaCl, 2mM EDTA, 0.001% Tween-20.